Custom Printed & Promotional Plastic Stadium Cups for your Advertising. Custom Printed Stadium Cups (display page & prices) with your logo are the best promotional items money can buy. Watch your ad message to soar! Many styles, sizes, designs, and colors to choose, and sold here at rock bottom prices! The custom imprinted blue stadium cup with your logo in white or red ink looks fabulous! And the red stadium cup printed with white or blue ink makes a great color contrast. Your company or organization logo, business name, and or your message will be bright and very visible and appealing to your customers everywhere. These high quality custom imprinted stadium cups, with your logo, make great advertising specialties for church promotions, school programs, all type of seminars, convention centers, trade shows, food stores, libraries, hotels, book stores, business meetings, bank institutions, state, city, and county fairs; for fund raising, give-a-way programs, job fairs, cruise liners, airline companies, shopping centers, department stores, Christmas and Holiday gifts; employee incentives, weddings, business or family picnics, and many other uses you can think of. These custom imprinted stadium cups meet every one's needs, and we have a stadium cup idea for every event and season. Try them. You will like them! Delivering high quality products and services at low prices, and complete customer satisfaction is our primary goal. ARMU Products has been providing these great advertising specialties, promotional items, customized apparel, and business gift ideas at low cost to businesses, all type of organizations, schools, and satisfied consumers in the U.S.A., and various parts of the world since 1981. 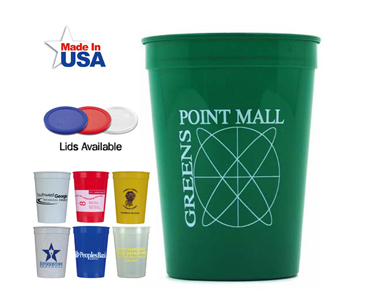 Stadium cup colors available: White, Granite, Red, Blue, Green, Yellow, Nite Glow, and a great variety of mood stadium cup colors. For complete information about prices, designs, quantities, colors, sizes, and styles, click on the link at the bottom of this page, or visit our Custom Imprinted Cup Page & Prices for more details. Blank stadium cups (no imprint) are also supplied in a great variety of designs such as the mood stadium cups at very competitive prices. As you place your complete order, blank stadium cups are usually shipped within 3-4 working days. NOTE: Prices, colors, material weight, designs, sizes, quantities and styles are subject to change without notice. For complete information, artwork preparation & requirements, imprint size, ink colors, order form, and many other stadium cup ideas and styles available, click the link at the bottom of this page, or call us, or visit stadium cup designs, colors and sizes. To place your order, click here. Then follow the instructions in the ordering form, or call us at the telephone number shown at the end of each page to place your order. Remember, we are here to serve you, and customer satisfaction and high quality service to our customers is our main goal. Promotional Stadium Cups at amazing low prices. Advertising Specialties imprinted quickly & at low prices. or call us at the telephone number found at the end of each linked page for more information. Email your request, inquire, your purchasing order, and/or your artwork to: Customer Service.